Brazil’s dramatic penalty shootout victory over a rather unfortunate Chile in the round of 16 on Saturday has become the most tweeted match of the World Cup so far, clocking up an impressive 16.4 million tweets overall. This beat the previous record of the tournament, which was the Brazil vs Croatia opening game, which triggered 12.2 million tweets. 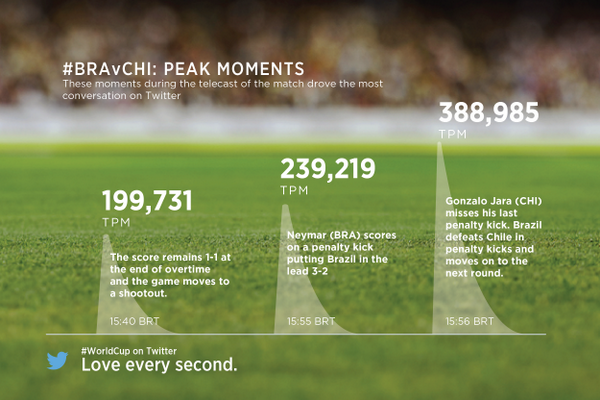 The Brazil vs Chile matchup peaked at 388,985 tweets per minute (TPM) at the moment the host nation clinched victory in the shootout, with Neymar’s penalty kick, which gave Brazil a 3-2 lead, also generating a large response. 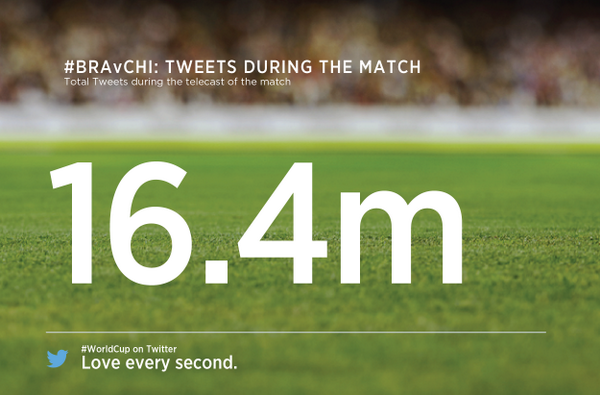 Last week Twitter revealed that more than 300 million tweets have been sent during the World Cup.